How To Make a Good Rifle Great! Having squeezed some incredible 3-shot groups from a SIG716 Patrol with a Leupold 1.25-4x Patrol scope,and a light R.R.A. Varmint trigger that sometimes caused a delayed-ignition with hard foreign military primers, I thought I needed to change up the scope and the trigger on the 716 and reach out a bit further. I set out to tap into all the capability inherent in the little SIG 7.62 NATO carbine. The Timney drop-in trigger that we used on the SIG516 Patrol was a gem! It had plenty of smack to ignite the most stubborn foreign primers and yet it provided a crisp 4-pound pull. It was also super easy to install: no muss, no fuss, literally a 5-minute job. We asked Timney for an AR-10 trigger and we again had a trigger that would hammer the hardest primers with authority and yet kept the trigger pull weight around 4-pounds. The Bushnell Elite 6500 2.5-16x50mm riflescope we mounted on the 716 offered super fine statia on a MIL-DOT reticle, a crystal clear field of view and a high degree of color fidelity under all lighting conditions. Given the type of hunting I do, that last quality, color-fidelity, is always important to me. The side-mounted parallax adjustment seemed to be accurately calibrated to known distances (the Leupold Mark IV we tested had no such yardage indications which may or may not be a deal breaker for you). Mounted in a stable Leupold 30mm I.M.S mount, this combo allowed me to see small targets at extreme distances and provided little zero shift when removing and remounting the scope. When this rig traveled out west with us, I rolled a dog that was lazed at 418-yards by CWO Don Zeien (USN-Ret) and I think he had a new found respect for what a 16-inch barrel 7.62 NATO rifle with good glass could do. I think it worth mentioning that the wind we encountered out in South Dakota that day was strong enough I needed over two mil-dots of wind correction to make that 418-yard shot with a 168 grain Hornady AMAX round! Both my 716 and my SIG516 Patrol (With the Leupold Mark IV LR/T) were blown over onto the rocky ground we were perched on by the fierce winds. Both rifles retained their zeros! 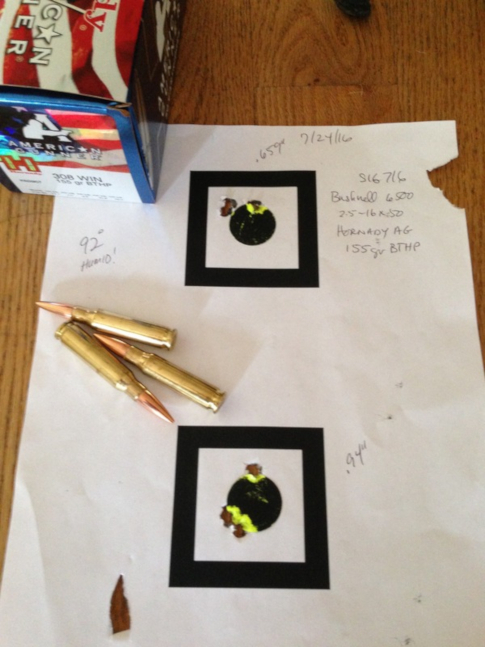 Target results with: Hornady American Gunner .308 Winchester 155 grain BTHP ammo. 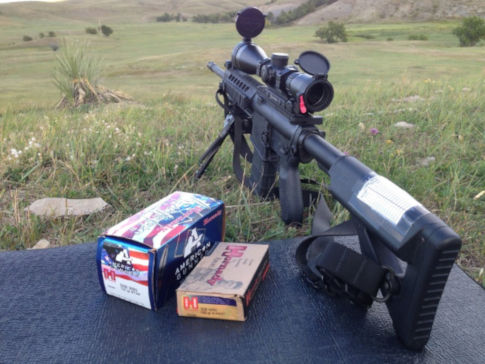 The 716 Patrol/Timney/Bushnell Elite 6500 combo proved to be extremely accurate as the photos of range testing attest. 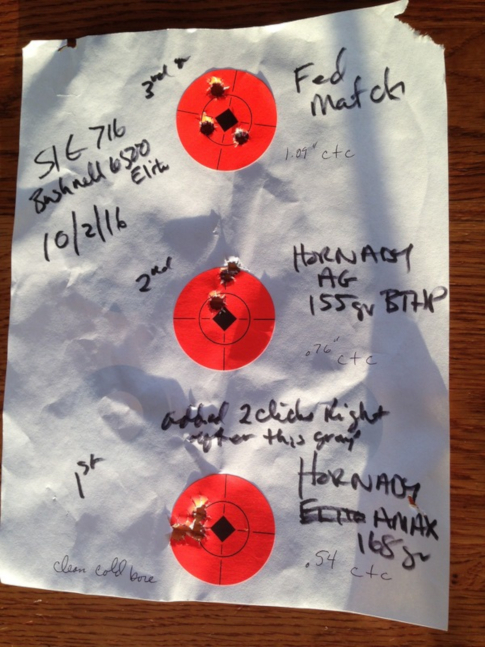 For some reason, I am beginning to think that Hornady and SIG are in cahoots as both Hornady's American Gunner 155 grain BTHP and the AMAX 168 gr ammunition stole the accuracy show at the range. While the Winchester and the Federal 168gr BTHP Match Ammunition shot very well in this rifle too, they could not equal the SIG's preference for the Hornady stuff. All the ammo tested turned in sub-MOA groups. As upgrades go, the Bushnell Elite 6500 and the Timney trigger are no-brainers to recommend. I love products I can recommend without reservations. 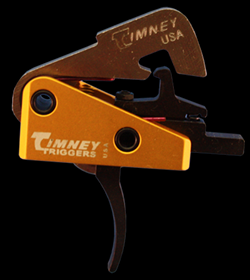 The Timney trigger is a simple and robust solution to getting a crisp and reliable trigger pull in an AR10. The Bushnell Elite 6500 is an amazing bargain in rifle scopes. Really! It's very easy to throw money at optics and be happy. I love Leupold optics and you can pry my Mark IV from my cold dead fingers. 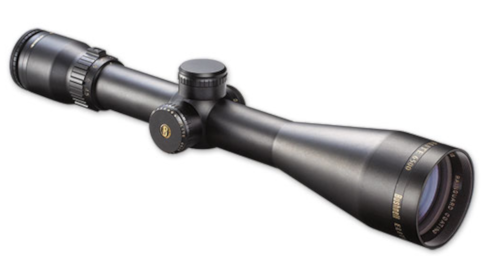 It's not so easy find a mid-range scope that exhibits capabilities far beyond its price point.